This is my first play with ColorLab - and this was a pretty nifty color combo - Perfect Plum, Riding Hood Red and Lucky Limeade. I loved working this combo! 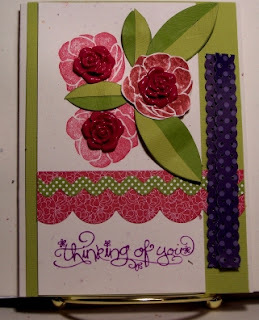 Everything here is Stampin' Up! So glad you joined us and shared this lovely card. I love how you've done your flowers. Thanks for playing with us at the ColorLab! I absolutely love your flowers. Gorgeous card. Thanks for joining us at ColorLab.